This knife is really great i would recommend it to any one, it could be sharper but you can fix that easily. Nice. Fast open like lightning. My daughters like them. I like this knife! It feels quite solid and the look is different but still good.Different, certainly, but worth consideration if your're looking for another knife, a spare knife or perhaps a gift for a knife fan that marches to their own drummer. The blade is great. Comes sharp and ready to cut. It's very light weight and looks great, give it the red is pretty much pink it still looks cool. My only suggestion is to tighten the 3 screws that hold the knife together. Mine were very lose or im just an idiot. But 2 out of the 3 screws have already fallen out and i haven't had the knife for more than 5 days. So just be sure to tighten the screws on the back. This is a classic BudK folder that's back after being gone a few years. It has an 80s bad**s look and it's lightweight and solid. Check it out. Got this atomic steel red and black pocket knife in the mail today. 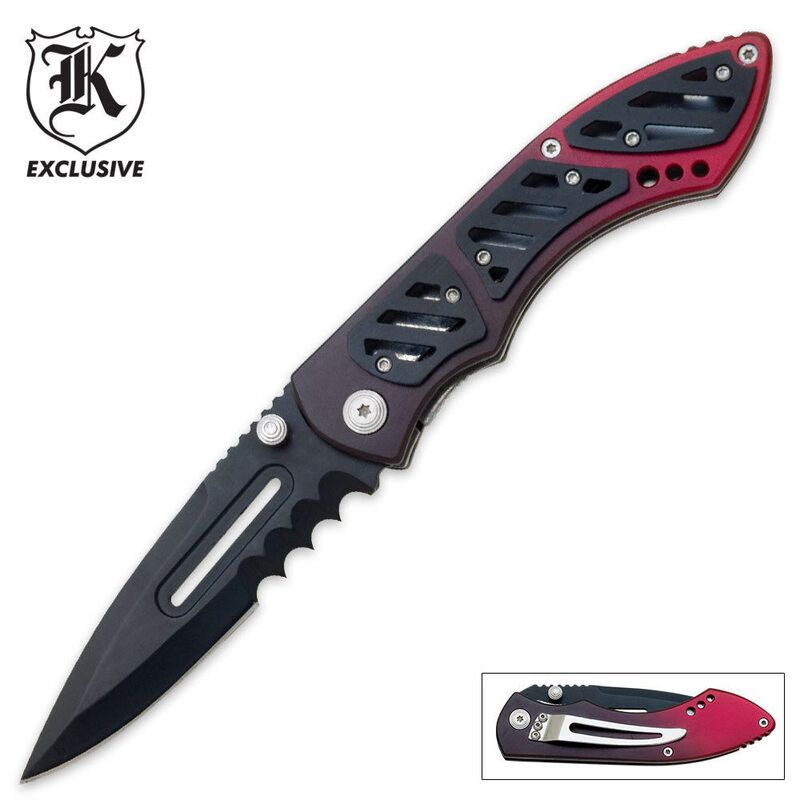 The blade has a nice shape, and looks really cool overall, but the knife is actually black and pink, not black in red. If it is red its a hot red, or baby red. So that's the only drawback really besides a dirt spot on the handle. Might return in for a different knife if that's possible? It's a great knife! The only problem with it was that the serrations were a bit large and not very good for cutting anything. I have had this knife for a long time now, so I thought it was about time I wrote a review. The knife has held up fairly well considering all the abuse I put it through. I tend to use my knife for everything, even if there is absolutly no reason to so it gets put under quite a bit of pressure. After months of daily abuse it's still in one peice and functioning quite well. The only problem with that knife was that after a month or two the blade began to wiggle a bit when open. This would be easily fixed if it wasn't for the fact that the part that holds the blade to the handle is held in with a screw that has a strange start shaped screw I don't have in any screwdrivers or drill bits. Other than that, one of the small black peices on the handle became a little loose at one point but fortunatly those screws have a hex head and can be tightened with the appropriate allen wrench. My friend has several knives of his own and after toying with mine and seeing me put it through the abuse that I do, he requested I purchase him one from Trueswords with my next order. I did and he is also very happy with his. Overall a great knife. The serates come in handy (even though they are rather large) and the thumbstub allows for easy opening. Comfortable to hold and the locking mechanism works as it should. Woah, awesome knife. I was surprised when I took it out of the package. I recommend this to anyone who needs a good tool to carry around, as it is very sharp. Stunning design and colors.